It is imperative in the Modern Healthcare Marketplace for Large Hospital Groups, Private Practices, Critical Access Centers, and Large Multiple-provider Outpatient Centers to produce quality contracts that provide for the health of the organization and meet the needs of the Providers. A good contract finds balance and effectively communicates the shared responsibility and benefit within the verbiage. 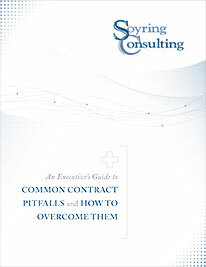 Download today to learn the four common contract pitfalls to avoid, as well as practical alternatives to consider! Soyring Consulting provides clinical and managerial consulting services to healthcare facilities of all sizes, including Investor-owned, Not-for-profit, Community, University, and Faith-based facilities and systems. Our team has worked in more than 35 states across the United States in all areas, including cost savings initiatives, work process re-design, and quality assurance programs among others. By combining our experience, proven knowledge, and time-tested skills, we work with your team to create targeted opportunities, along with the plan and achievable goals to get to them.